Two 50-ounce jars with removable blades: Give you double the capacity of standard blenders! The glass and stainless steel jars are durable enough to resist scratching and discoloration. And the two separate blades are removable for easy cleaning. Ice crush function: Select the maximum speed, and this unique function will easily crush ice by intermittently pulsing for maximum efficiency. 5-speed soft-touch controls with pulse: Illuminated soft-touch controls are easy-to-use and guarantee the perfect speed for all blending tasks. Lids with removable ingredient cap: The durable, sealed lids have three positions: locked, open to pour and open to remove. Remove the cap to easily add ingredients. Dual safe system: A De'Longhi exclusive, this system is equipped with an automatic safety device that shuts down the motor if the jar is removed from the base while in operation. Two removable blade assemblies included: For easy cleaning and convenience. Brushed die-cast aluminium base: Heavy-duty base ensures maximum stability, and brushed aluminum finish beautifully complements any kitchen decor. Gradual start feature: Automatically starts the blender at a lower speed to prevent splattering, then quickly increases to the selected speed for optimal performance. Drop-on jars: No need to turn or twist the jar for perfect positioning. 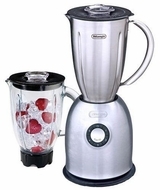 Just drop the jar onto the base, and it will automatically lock into place, just like professional blenders.